In a village in the beautiful Dysynni Valley lives a man who makes chairs and tends his rare breed sheep; this man is Geraint Pryce Edwards. Geraint lives on a smallholding that is situated in the middle of the village of Bryncrug, the family’s farmland jigsaws around the village’s houses and gardens. In his traditionally equipped workshop he creates his chairs with sustainably harvested wood, some from the farm and the remainder sourced as locally as possible. 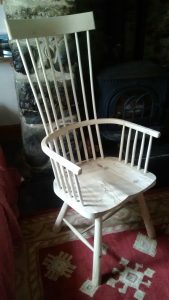 Oak, Ash, Birch, Elm and Beech are used to create his chairs. The chairs are all handmade, one at a time, following traditional construction techniques from bygone days. The Welsh green woodworking tradition yields a strong and long-lasting chair, each one a little different from the next depending on what the wood dictates. The chairs are finished with traditional milk paints or lightly stained and waxed, using a method passed down to Geraint by his grandfather. Geraint left home at sixteen to serve an apprenticeship in Engineering at Rolls Royce. Here he learnt the attention to detail that you will see in his beautiful chairs. He has had a varied and interesting life which has included spending ten years in Nigeria doing humanitarian work and helping to improve the water supply to the Southern Delta region. In the initial two years he was the Project Manager of a Vocational Training Centre, and it was here, through another volunteer, that he was introduced to African and English green woodworking. It left a lasting impression and inspired him, on his return home, to turn his talents to building pieces of furniture full of synergy and beauty with, of course, a little help from nature!